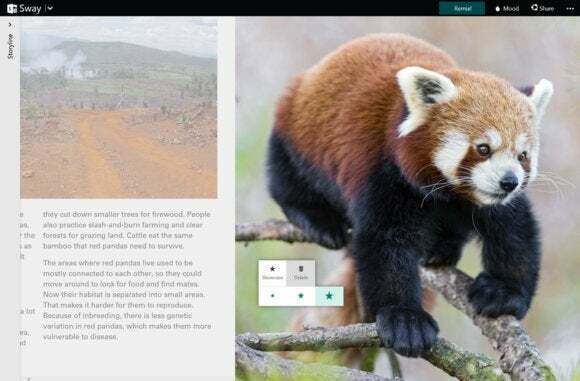 Call it a bibliography for the 21st century: Microsoft’s new Sway app will be able to pull images from the Creative Commons repository via Bing and use them to illustrate stories. Sway already allows you to import images from your own PC, Twitter, Facebook, or a variety of other cloud services. Now Bing has been added as well, and it will return images tagged with a Creative Commons license by default. Sway will even keep track of what you’re writing, and when it comes time to look for an image, it will pre-populate relevant images. Clicking the image will expand it, and the attribution will appear as a URL. It’s a convenience that will certainly appeal to students rushing to file a last-minute paper in time for a morning deadline. We’ve played with the Sway app, and found it has potential as a sort of hybrid Word-PowerPoint app for light content creation. It’s currently in preview mode; you can sign up for it at Sway.com.